The purpose was to compare studies across the two research groups and discuss possibilities for joint publications. The three researchers from IRIS presented results from their ongoing MUUVI research project, “Frameworks for change agency in public and private service organisations”. ISE researchers likewise presented recent research. 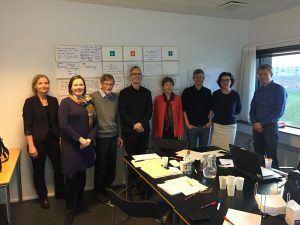 Following this, possible new research publications were discussed in a process that was skilfully and effectively facilitated by Mikko Lehtonen.